VIL DU HA MER UT AV TRENINGEN? David Phillip er lege og spesialist i sportsmedisin. Human Performance for Everyone by Jeff Olson, R.L.T. Hvis du trener trenger du å beskytte deg! Fire publiserte vitenskapelige studier har dokumentert at JuicePlus+ forbedrer markører for restistusjon og prestasjoner. 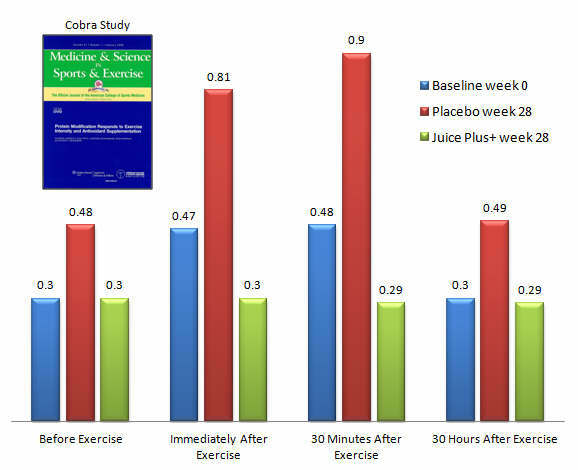 Medicine & Science in Sports & Exercise 2006 (full article) – Study findings: Juice Plus+ supplementation for 2 weeks attenuated the rise in protein carbonlys after 30 minutes of aerobic exercise, even after a 1 week washout. Journal of Nutrition 2007 (full article) – Study findings: Several indicators of oxidative stress, immunity, and illness improved in 41 highly trained men (special forces) consuming Juice Plus+ for 28 weeks. Medicine & Science in Sports & Exercise 2009 (full article) – Study findings: Exercising at 80% VO2max intensity, the Juice Plus+ group (compared to placebo) had lower baseline protein carbonyl levels after 16 and 28 weeks and no exercise-induced protein carbonyl increase. Human mercaptalbumin, another marker of exercise-induced oxidative stress, was also significantly lowered. Another study demonstrated the effectiveness of Juice Plus+ on muscle function and oxidative stress in response to an acute bout of eccentric exercise: Eccentric Exercise and Juice Plus+. In each of these studies, the all-important training effect was supported by Juice Plus+ while dramatically reducing the exercise-induced oxidative stress. The training effect (aka adaptation) of exercise is vital for the athlete to gain in strength and endurance – for example, muscle tissue must break down and be repaired to grow stronger. However, excessive damage caused by exercise-induced oxidative stress is to be avoided if possible. This study again demonstrates what all Juice Plus+ athletes know from their own experience: that those who take Juice Plus+ have less oxidative damage, while fully benefiting from their training. For more on Juice Plus+ Athletes in Europe visit www.juiceplussports.eu.